Google has made it easier for people to share their estimated time of arrival with others. 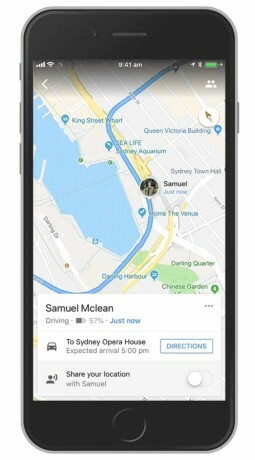 Moving forward, people can tap the ^ button in Maps to begin sharing their trip progress, which can include their live location, route, and ETA. The update allows live ETA info to be pushed via Gmail, SMS, and third-party apps, such as Facebook Messenger, Line, and WhatsApp. Once the journey is complete, the user automatically stops sharing their location. Further, people can now share live driving, bicycling, and walking journeys. This new tool is in the latest version of Google Maps for Android and iOS. Facebook today said Facebook Messenger users will once again be able to send SMS messages — as long as they're running Android. Essentially, Android users can set Messenger as the default SMS app, which will route all SMS messages and conversations through Messenger rather than any other SMS apps that may be installed on the device. Facebook is updating its Messenger application with disappearing stories that behave similar to those of Snapchat and Instagram. The feature, called Messenger Day, lets people create short stories made up of photos and videos and then share them with their Facebook friends. WhatsApp today announced that support for stickers and sticker packs is coming to its mobile apps for Android and iOS. The messaging service is initially offering stickers designed by its own staff and select artists, though it also hopes third party content creators will adopt WhatsApp stickers.